The emergence of HDR (high dynamic range) has magnified advancements and propelled manufacturers to create efficient 4K UHD HDR HDMI extenders. An HDMI cable can only take you so far in regards to an AV multimedia system. On the same note, a challenge that is encountered by installers and integrators alike is cable length and data. The ability to achieve remarkable audio/video quality, control, and power over long distances is what makes HDMI extenders an excellent solution. It’s no wonder many manufacturers are producing 4K UHD HDR HDMI extenders. The demand is there; take notice the next time you’re at Best Buy at how many TVs support HDR. 4K and Ultra HD aren’t the hottest topics anymore—it’s whether they support HDR. Our guys at BZBtv take on the challenge to find out which 4K UHD HDR HDMI extender trumps them all. Before we cover the best 4K UHD HDR HDMI extenders $600 and under, let’s cover the HDR basics. While the higher resolution of a 4K TV has more pixels, an HDR TV can do more with those pixels. HDR technology provides a higher level of contrast between light and dark images to create lifelike images on the screen. See it for yourself. Next time you’re out shopping for a TV, compare the quality of an HDR TV’s increased contrast and color depth to a plain 4K TV. Your eyes will realize a dramatic difference. When choosing a high-performance 4K UHD HDR HDMI extender for your application, the first thing you want to consider is the distance from HD source to display. Second, what type of signal do you want to transmit. For range, HDMI transmissions of less than 10 meters only require a regular HDMI cable. Anything beyond 10 meters will need some form of active signal extension. Let’s meet the best 4K UHD HDR HDMI extenders $600 and below. Now, coughing up $600 may seem a lot for extending an HDMI signal, but we’re not just extending your standard HDMI signal. We’re sending high-quality 4K resolutions at 60Hz, HDR, audio, Ethernet, IR, RS-232, and CEC while complying with HDCP 2.2. The Atlona AT-HDR-EX-70C-KIT is an HDBaseT transmitter/receiver kit for HDR formats. The extender pair is HDCP 2.2 compliant and supports 4K/UHD video @ 60Hz and data rates up to 18Gbps. The HDR-EX-70C-KIT provides transmission of HDMI, as well as bi-directional IR and RS-232 control signals up to 230 feet (70 meters) for 1080p video, and up to 130 feet (40 meters) for 4K HDR over CAT6a/7 cable. This extender kit features visually lossless compression with no latency to enable HDR and 4K/60 4:4:4 video signal extension over HDBaseT. For additional integration convenience, the transmitter remotely powers the receiver through Power over Ethernet (PoE). Also, Atlona’s extender has a convenient test button on the front panel of the sender. The test button is useful for a quick verification of the HDBaseT link. This feature is significant, especially if you’re doing it yourself and don’t have a test tool to verify the category cable running through the walls. Atlona’s AT-HDR-EX-70C-KIT is excellent for residential and commercial applications with the latest 4K/UHD and HDR sources and displays. All resolutions, audio formats, and color space standards covered in the HDMI 2.0b spec are supported. The AT-HDR-EX-70C-KIT includes Atlona’s award-winning 10-year limited product warranty. Also, 24/7 customer support allows integrators to install with confidence. The AC-EX70-UHD-KIT from AVPro Edge is a cost-effective, state of the art HDMI via HDBaseT extender. It utilizes a single CAT-5e/6a/7 UTP/STP cable to solve problems for both commercial and residential markets for distributing high-value 4K UHD content from rack to display. The kit allows 1080p extension up to 70 meters and up to 40 meters with a 4K UHD signal. Additionally, this product is HDCP 2.2 compliant and supports CEC while offering bi-directional RS-232 transport. The ultra slim design of the AC-EX70-UHD-KIT is perfect for scenarios where space is a premium. Furthermore, bi-directional power will allow the installer to power either the sender or receiver. The unit supports a Dolby Vision 12-bit color HDR, technically 64x more than a 10-bit standard used by HDR10. 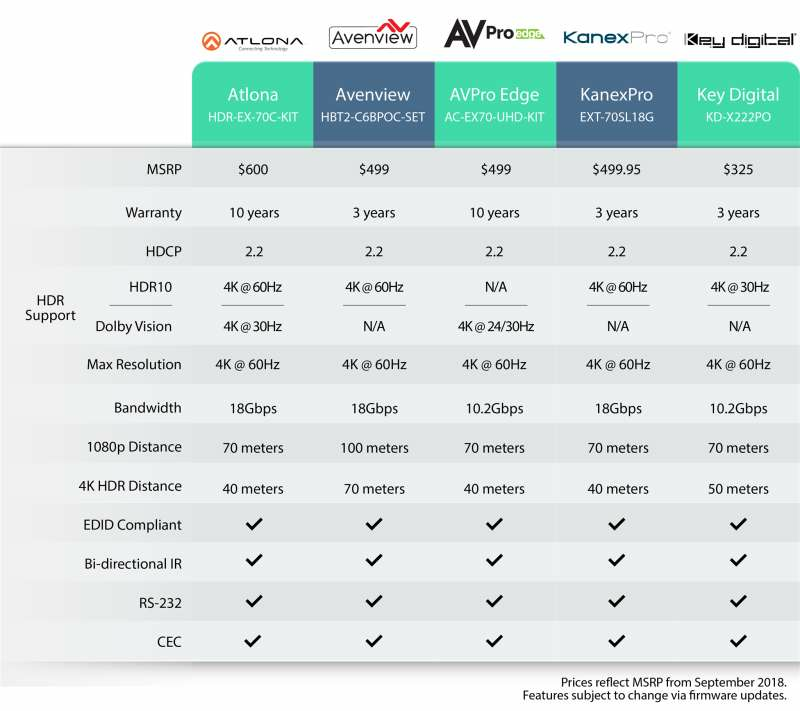 The AVPro Edge 4K UHD HDR HDMI extender is also covered with a 10-year limited warranty. There slim extender kit is ideal for residential digital entertainment centers, live events, corporate training environments, conference rooms, schools and any scenario requiring reliable and long-distance transmission. The Key Digital KD-X222PO is the most affordable HDMI extender out of the bunch, allowing transmission of 4K@60Hz up to 40 meters and 1080p up to 70 meters. Additionally, an extra distance of 20 feet is attainable for 1080p and 4K resolutions using Key Digital’s KD-CAT6STP1X super CAT6A shielded cable. The KD-X222PO also extends IR or RS-232 to control remotely placed equipment. The HDMI extender kit is HDCP 2.2 compliant and supports Deep Color, CEC, and 3D. Furthermore, lifelike video through a greater range of luminance levels is obtainable via HDR10 4K@30Hz. Combined with lossless compressed digital audio signals such as Dolby Atmos® to its low profile design, and you’ve got an HDMI extender that’s perfect for home cinema and commercial applications. Under Key Digital’s 3-year warranty is a 100% reliability guarantee. KD will either repair or replace a defective unit with an item of equal or higher specs. We like the sound of that! 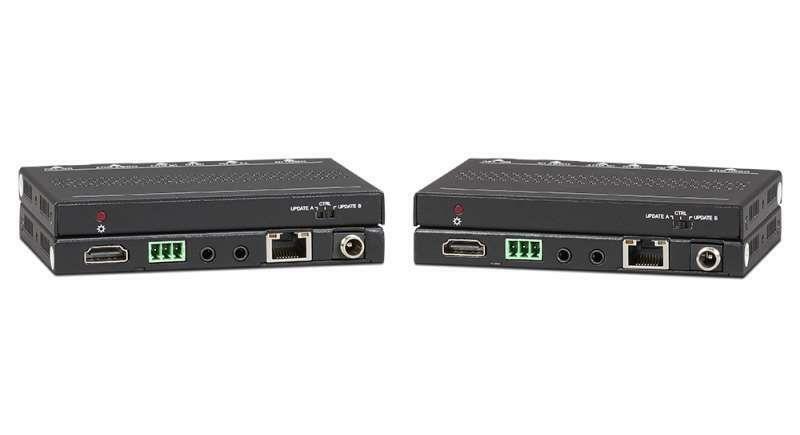 The Avenview HBT2-C6BPOC-SET HDMI over HDBaseT extender kit enters our discussion with high performance. The product can send 1080p video and multi-channel digital audio up to 100 meters (330 feet). On the other hand, a 4K HDR signal can travel up to 70 meters (230 feet) to any display over Cat5/6/7. Under $600, the Avenview extender can travel the longest distance compared to its counterparts. This unique model allows 18Gbps data transmission. Uncompressed 4K@60 4:4:4 8-bit or HDR signal with 4:2:0 10-bit chroma subsampling is achievable over any CAT6/7 cable to a 4K HDR TV. Also, 7.1ch digital audio, bi-directional IR, and RS-232 signals are also supported. Users can control their desired device with ease. The Avenview HBT2-C6POE-SET grants the most convenient solution for sending video and audio over very long distances. Furthermore, the unit offers high-quality results from 4K GPUs, Xbox, PlayStation, and Blu-ray devices. Avenview’s 3-year warranty covers repair, replacement, or rebuilt components at no extra charge. The KanexPro EXT-70SL18G 4K UHD HDR HDMI extender makes the list with its super slim and robust design. 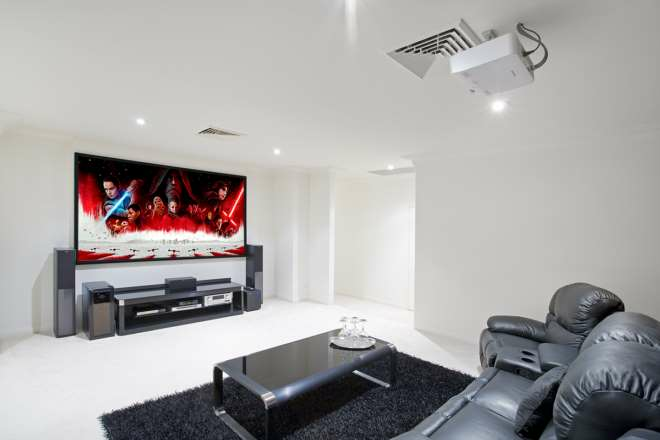 The unit can extend 4K signals from your HDMI source device to any 4K display remotely located 230 feet away. Additionally, a 4K@60 HDR10 signal will pass up to 125 feet. Also, power over HDBaseT allows bi-directional power from either the transmitter or receiver. 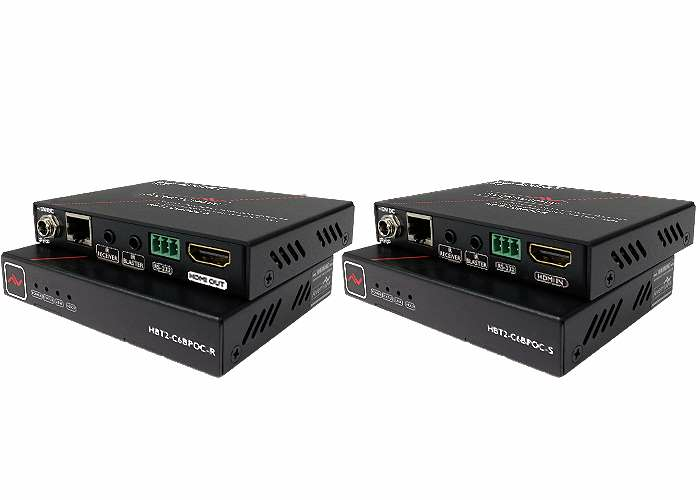 Compliant with HDCP 2.2, the KanexPro HDMI extender set supports EDID and CEC pass-through to permit HDMI-CEC enabled devices to interact and operate smoothly. During control, it allows bi-directional IR & RS-232 pass-thru to send control instructions to 4K displays for turning on/off as well as other uses. KanexPro’s 4K UHD HDR HDMI extender is useful for digital signage, control rooms, education facilities, smart homes, and more. Under their 3-year limited warranty, KanexPro will either repair, restore, or offer a refund. Why a 4K UHD HDR HDMI Extender? They may all seem like the same black box, but they all have advanced features fit for unique situations. Some of them sport an ultra slim design to help with mounting in tight places. They are all capable of 4K and HDR resolutions, but only a few will work on an 18Gbps ecosystem. Many TVs support HDR10 4K@60 while other TVs only show HDR10 4K@30Hz. What if you own a Panasonic DMP-U700 4K Blu-ray player? Well guess what, this device does not support Dolby Vision. The same can be said if you only want to watch Dolby Vision at 12 bits; you’ve got to make sure your TV and HD source can support this format, including the HDMI extender you are purchasing. The bottom line is there are many circumstances to consider. Do your homework and know the components you’re working with before shopping for a 4K UHD HDR HDMI extender. Each of the five aforementioned extenders can hold their own when it comes to extending an HDMI signal. It’s not always about the price, but the signal you want to send, the distance you are trying to cover, and what signal formats your HD source devices and TV can support. Doing research can be time-consuming; let our staff do it for you! Our BZB Express experts are ready to help: chat online or give us a ring now.